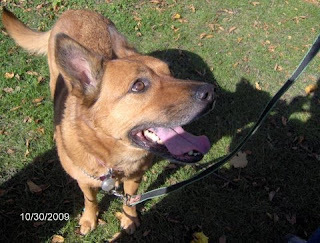 We were so sad to hear that Kanga, a really fun and loving dog adopted from our shelter 7 years ago, recently died due to Leukemia. Her illness came on quickly and she was gone before her family even had time to come to terms with the thought of losing her. Kanga was at our old shelter, which was really just a shack that didn't even have running water, for 7 months. In spite of appearing as our Pet of the Week in the Hometown Weekly newspaper three times, hardly anyone even expressed interest in meeting her, due to her energy level and lack of obedience training. 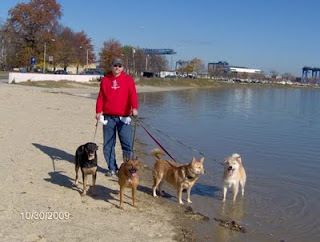 The couple that adopted her proved to be extremely dedicated and caring dog owners who invested the time and energy in making sure she received the exercise and training she needed to be a great pet and she thrived under their care. They are devastated by their loss of this loved member of their family, and those of us that knew and loved Kanga are too.